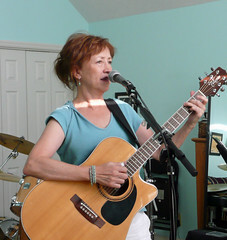 Singing with guitar can be helped or sabotaged by some subtle stance choices. I've been having to up my game due to my upcoming band showcase - I play guitar on a couple of our songs. 1. Gary Talley noticed two things.. that my hands were weak from not playing for years (I got complacent... playing guitar on keyboard settings). That has been cured by just DOING IT. He also noticed some chords that I could be making much easier, with fewer fingers and less motion necessary. Again... practicing will bring that home. 2. While rehearsing with me on afternoon, my husband John noticed my weird hand positions. Ergonomically- minded drummer that he is, he suggested I raise the neck of the guitar to make my hands less awkwardly positioned and cramped. OH MY GOSH... presto, so much easier to play! My chiropractor confirmed this wisdom. 3. Dr. Allison noticed that my back muscle tension below the right shoulder blade was due to my uneven shoulders while playing. He had me lower my left shoulder (on the neck side of my guitar) til it relaxed the muscle cramp I had been creating in my back. OH CHEEZBURGERS, THAT feels better!! He also suggested that I put one foot more forward to keep my head back so my chest stays open. (He's my guitar-playing vocal student, so he knows that I always advocate not crunching over a guitar so as not to tighten ribcage). 5. It's not enough to know intellectually... I really do have to practice these new stance tips. I have to practice enough - correctly - so I don't have to THINK about them when I'm on stage. When I sing and play, I have to be a singer playing, not a player singing. The voice comes first. And... when it does, I can remember my dang lyrics! OK, what say ye singing guitar players... have any thoughts or suggestions? Please share! Being a classical-singer-moving-into-vernacular and beginning fingerpicker, all of these are really helpful. I so want to have a low-slung guitar, but it's just not going to work! Nor will a short strap do. :-) Angling is really the best way. Just discovered your site, The approach is compatible with the small amountt of pop coaching I've had in ATL . . . and your life experience and humanity really shines through. Thank you. As a novice singer-songwriter, I've noticed that there really are a lot of things to master when performing with guitar-- It seems like if I'm not forgetting parts of the lyrics, I'm forgetting part of the guitar chords/technique! For me, it is mostly a matter of needing MORE practice. Haven't had any aches or pains, but I do usually have my guitar neck up. Will try out putting one foot more forward, though; that's a good idea-- anything that can open me up for better breathing and singing is very much needed. I tend to freeze up with tension, so there is already constriction happening just because of stagefright. Carol... Yes, I find the angling especially helpful when I finger pick. Thx for the comment and keep in touch! Diane... you might try thinking about who you're really singing to (not the audience... the object of the lyric!)... in order to help with that tension freeze. I have several posts on stage fright, check them out and let me know if something help you! I reckon that my stance is pretty close to what you do, though standing on stomp boxes and drumming with my feet adds a whole new level of complexity and challenge. I have refined it for years. I can't play sitting down. Ed... standing on stomp boxes and drumming ... you definitely get the uaward for multitasking guitar player! And when you're singing, you have to put THAT first! Whew. Hats off. Yes, see you at your next lesson! I certainly have had to put up with that pain in my right shoulder when playing guitar and singing. I'll have to try that foot-forward approach. I have some disc problems in my back anyway and anything to help is appreciated. I usually wind up having to rotate my shoulders during a set to ease the pain. The Raspy Voice... Cool Sound or Vocal Suicide? In-Ear Monitors: Don't Use Just One! Demo Lead Vocals: Can They Be Released? 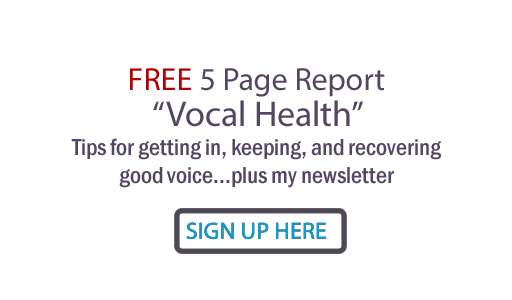 Should You Do Your Own Background Vocals?